Click here to see a version of this blogpost in British Sign Language (BSL). While I am on research sabbatical from Heriot-Watt University I am fortunate to be spending my time as a Visiting Research Fellow at the Institute for Advanced Studies in the Humanities (IASH) at the University of Edinburgh (see here for overview of what I am working on). As part of my fellowship I have been able to avail of IASH facilities to organize a workshop with a leading scholar in the field of Deaf Studies, Dr Annelies Kusters, to bring together a small group of researchers who work with sign language data. The 2-day workshop took place on 25-26 October 2018 and was by invitation only. 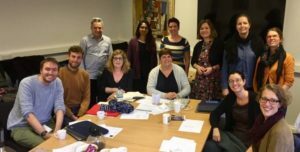 Our priority was to invite deaf and hearing researchers that are fluent British Sign Language (BSL) users, and who are currently grappling with issues either to do with the analysis of qualitative sign language data, or are exploring new and innovative qualitative research methods. One of the reasons we wanted to ensure that everyone is a fluent BSL user is because we wanted to avoid holding discussions through interpreters, to allow for more in-depth and organic discussions. And this certainly worked! The majority of the 12 attendees were my colleagues and PhD students from the Department of Languages and Intercultural Studies at Heriot-Watt University, but we also had several attendees from other UK universities and also one Finnish university. This exploratory workshop was a huge success, so we hope to make it an annual event, and open it up to other sign language researchers. Many of the issues we dissected are not unique to sign language researchers by any means, but being able to come together and have the space to have open and frank conversations about our work in sign language was a rare and much valued opportunity. We are considering a proposal for an edited volume based on the format of this workshop, so hopefully that will be a book that we can add to the IASH library one day!